Chances are you're already familiar with Cadbury Creme Eggs, the popular chocolate-coated eggs with the liquid creme filling. Frying the eggs until they're golden brown produces a crispy, crunchy outside, while the inside melts into a sweet, gooey chocolate-and-creme puddle. If you've ever had deep-fried treats at the fair, you know the appeal of frying surprising foods. Imagine serving these candies as an unexpected Easter dessert, complete with a scoop of whipped cream or ice cream and a drizzle of chocolate sauce. It's easiest to use purchased creme eggs, like Cadbury eggs, in this recipe. But if you want to go the entirely homemade route, you can make your own creme eggs. For a similar candy with a firmer cream center, you can try fondant Easter eggs. Refrigerate the eggs for an hour before frying them, or place them in the freezer for 15 minutes before frying. They are less likely to leak during the frying process if they start out cold. While the eggs are chilling, prepare the batter. In a small bowl, whisk together the flour, baking powder, milk, 1 teaspoon of vegetable oil and salt. Whisk until the batter is free from lumps. Fill a medium saucepan with 1 1/2 inches of oil (this will be about 4 to 6 cups, depending on the size of your pan.) Place the pan over medium heat and insert a candy/deep fry thermometer. Heat the oil until it reaches 375 F.
If the eggs are still in their wrappers, unwrap them. Dip an egg in the batter, covering it completely. Then carefully place it in the hot oil. Cook the egg for about 3 to 4 minutes, until it is golden brown on all sides. Remove the egg from the oil using a slotted spoon or frying tool and place it on a plate lined with several layers of paper towels. Repeat this process with the remaining eggs. As you cook them, continually monitor the temperature to make sure it stays around 375 F. If it gets too hot, remove it from the heat briefly, and if it cools down too much let it heat up again before resuming frying. Serve them with a sprinkling of powdered sugar or a drizzle of chocolate sauce, caramel sauce or berry puree. 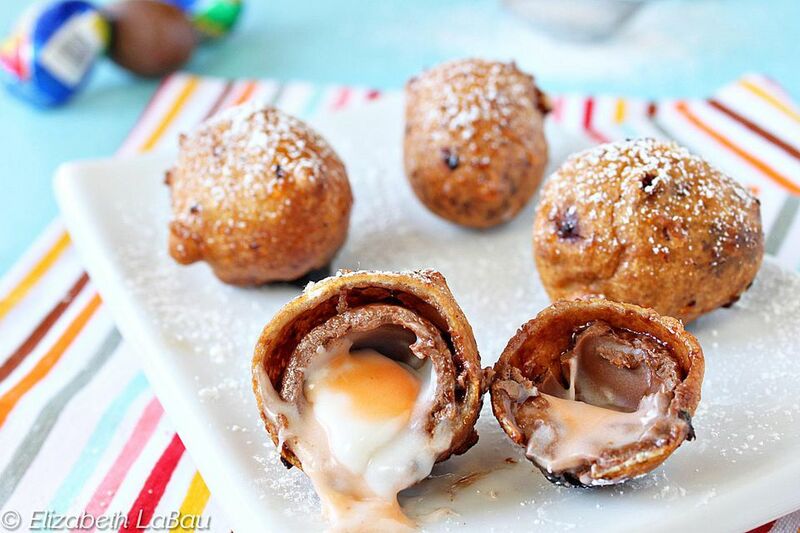 Deep-fried Easter creme eggs lose their liquid center and crispness within about 20 to 30 minutes of frying, so once all of the eggs are cooked, they should be enjoyed immediately.